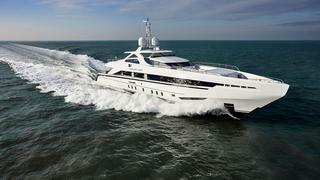 The 45 metre motor yacht Amore Mio, listed for sale at Heesen Yachts, has had a €2,800,000 price reduction. Built in aluminium by Heesen and delivered in February 2016, she is the largest and most powerful sports yacht ever built in the Netherlands, according to the yard. She has an aggressively sharp profile as the line of the narrow, raked bow is interrupted by a 'knuckle' shape. Her interior, styled by Christiano Gatto, uses Canaletto walnut veneers throughout and is complemented by Loro Piana fabrics. Accommodation is for 10 guests in five cabins consisting of a full beam master suite on the main deck with two doubles and two twins below, all with en suite bathroom facilities. The main deck saloon of this yacht for sale is open plan with comfortable seating on sofas arranged in an L-shaped configuration and features a bar and entertainment centre. The aft deck is one of several areas boasting al fresco entertaining and dining facilities, with space for 10 guests around a large rectangular island table. Upstairs, she offers a notable 18 metre sun deck with a cinema, dining for all 10 guests, a square pool and an infinity terrace. She is powered by twin MTU 16V 4000 M73L diesel engines and has a range of 2,750 nautical miles at 12 knots. In addition, roll motion at sea and in port is minimized with the aid of three Sea Keeper gyroscopic zero speed stabilisers. Amore Mio is now asking €25.9 million.